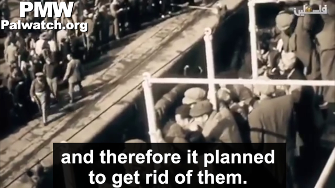 and therefore it planned to get rid of them"
we will erase the memory of this [Balfour] Promise"
PA TV antisemitic cartoon shows Russian kicking Jew during the Kishinev pogrom in 1903, and asks rhetorically: "Did the Balfour Promise come as a surprise 100 years ago?” - indicating that Russia and everyone else along with Europe wanted to get rid of the Jews. It's that time of the year again... when Palestinian Authority officials lash out at former British Foreign Minister Arthur Balfour and curse him and Britain on the anniversary of Balfour's declaration from 1917 that Britain favored "the establishment in Palestine of a national home for the Jewish people." "The old continent was sick of the behavior of the Jews at the time, and therefore it planned to get rid of them." Saidam's posted text: "101 years since the ominous promise... Here is a simple explanation of the Balfour Promise for its anniversary..."
It was said that the old continent [Europe] was sick of the behavior of the Jews at the time, and therefore it planned to get rid of them... British Foreign Secretary at the time Arthur James Balfour stabbed a dagger into the soft belly of Palestine. He took upon himself a promise from one without ownership to one not entitled, as if he was the owner of the land and not a colonialist." It is fundamental PA and Fatah ideology that Europe supported Zionism "because of the evil nature of Jews" and wanted to get rid of them. This antisemitic view has been repeated numerous times by PA and Fatah leaders to explain why Israel was created. 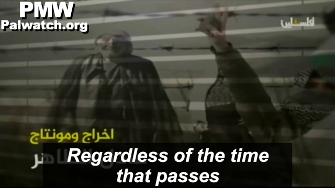 Palestinian Media Watch has documented that official PA TV broadcast a Fatah documentary that explained it was the "Jews' character traits" that led Europe to want to "get rid of them" and push for the establishment of Israel. 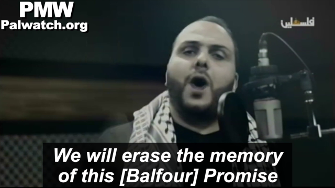 We will not be silent from this day forward, we will not forget the cause..."
The same expectation is expressed in the video below which official PA TV has been broadcasting regularly for the last six years. It shows "the history of Palestine" and its different foreign invaders who have come and gone - an ancient Roman soldier, a Crusader, a British soldier, and finally a Jew. In the end, "Palestine" - symbolized by a woman in white - is saved by a Muslim conqueror - a new "Saladin." He represents the coming savior who will "liberate Palestine" from Jewish-Israeli rule. 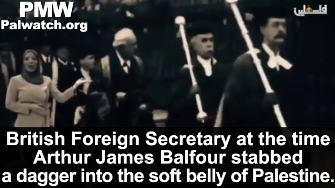 Official PA TV narrator: "Did the Balfour Promise come as a surprise 100 years ago? During his campaign to the east, Napoleon [Bonaparte] called to the Jews of the world to settle in Palestine. [German Emperor] Wilhelm II afterwards discussed settling the Jews in Palestine with his friend Ottoman Sultan Abdul Hamid II." A drawing is shown of a Russian leader and the year 1903, the year of the Kishinev pogrom. Afterwards the following image is shown of a Jew, characterized by his large nose and long beard, being kicked by a Russian, indicated by a Russian flag. Narrator: "A state to the Jews, in a place where there is not a Jewish majority. In other words, humiliation of the Arabs, expulsion of the Palestinians, and the oppression of those of them who remained." An image is shown of a woman holding a Palestinian flag facing four extended arms, with the flags of Italy, the US, France, and Britain. The arm with the British flag points a gun at the woman. In the background, on the side of the extended arms, an Israeli flag is planted in the ground. 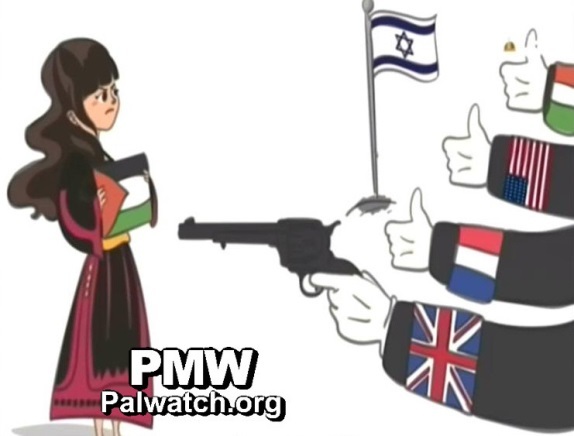 PMW reported extensively on the PA's statements against the Balfour Declaration last year, on the declaration's 100-year anniversary. Click to see more examples of PA Antisemitism and the PA's denial of Jewish history in the area and in Jerusalem in particular. This is just a drop in the sea of Britain's crimes against our people, whose existence it has insisted on denying despite its Phoenician and Canaanite roots, despite historical testimony, and despite its culture, which exists until this day. Has not the time come for Britain to apologize for its ethical and practical responsibility for the tragedy that led to the uprooting of approximately 700,000 Palestinians - who today have become more than 5 million who are scattered throughout the world? We are still adversely affected by this, as what is called 'the Jewish [national] home' in this promise continues to expand and to gnaw at our land." 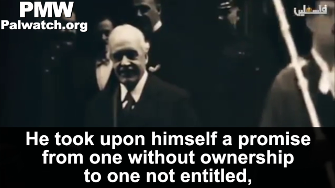 The Balfour Declaration of Nov. 2, 1917 was a letter from British Foreign Secretary Arthur Balfour to Baron Rothschild stating that "His Majesty's government views with favour the establishment in Palestine of a national home for the Jewish people." In 1922, the League of Nations adopted this and made the British Mandate "responsible for putting into effect the declaration," which led to the UN vote in 1947 and the establishment of the State of Israel.